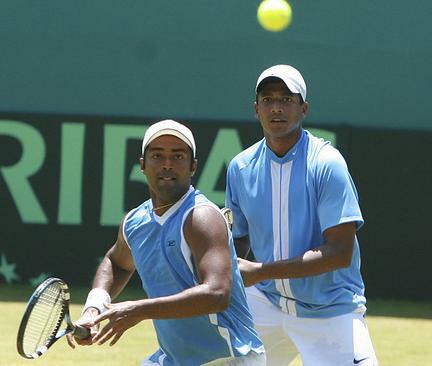 Chennai, India: Trailing 0-2, the Indian Doubles Champion, Mahesh Bhupathi and Leander Paes, played together after a long gap, now for country to win the doubles rubber of their Davis Cup against Marcelo Melo and Bruno Soares. India now trail 1-2, with 2 singles rubbers remaining. Playing the doubles rubber, after India lost both the Singles yesterday, the ex-doubles champions from India showed why they wer so dangerous together, once upon a time. Now they play together only for country. Marcelo Melo and Bruno Soares had no clue, although in the second set they took the game to tie-braker. In 2 hours and 19 minutes Indians emerged winner in straight sets. Bhupathi & Paes def Melo and Soares 6.4, 7-6, 6-1. India still have almost no chance now to qualify for the Elite World Group as in the back-to-back singles Somdev Devvarman and Bopanna would need a miracle to win both the matches. On the other hand one more win will get Brazil finally, after a wait of 4 consecutive years, to the Elite World Group of Davis Cup.